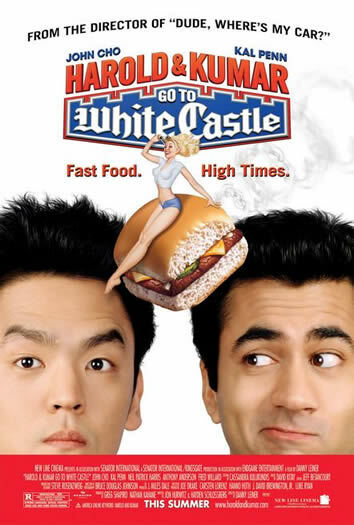 The Story: "Harold And Kumar Go To White Castle" is an amusing, hilarious comedy not to be taken too seriously and not to be dismissed as just another silly stoner comedy. Certainly there are plenty of elements which appeal to those dophamine, "good times" movie-goers, yet there are also some classic instances of comedic greatness. Aside from chronicling two inane potheads on a quest to satisfy their appetites, "White Castle" offers a great coming-of-age and funny coincidence premise, which reminds us of the heavy, sadistic curveballs life hurls at us, sometimes when we merely desire something simple and cannot attain it. Here is a story of a simple goal by two simple minds: to find a White Castle hamburger joint and fulfill the lasting effects of "the munchies". Yet, as these two stoner friends come to realize, even the seemingly simplest of goals in life can be impossible to achieve, due to such disturbances as irony, circumstance, error, and misfortune, as they are all encountered in this journey. The comic elements are listless: stoner instinct-gone horribly awry, catastrophic error, not-so-pleasant raunchy surprise, near-death escapes in the most unlikeliest of ways, and the eventual finesse of overcoming all obstacles to finally enjoy a binge at a hamburger joint.